Picture this: You’re remodeling or renovating your home. Wouldn’t it be nice to view inside a wall to see the wires or ductwork within? How about the chance to penetrate pipes and see what’s clogging them? 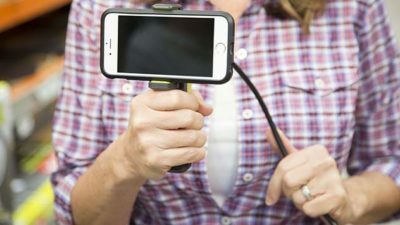 Just download the app to your smartphone, connect to Wi-Fi and attach your smartphone to the device to display the camera’s footage. Hi, Tim! We’re always looking for ways to better serve our fans. Can you please elaborate on what you mean when you say the intro starts every time? Why when going through the best new products video must the intro start every time you go from one page to another? It does get annoying. Just a thought.